Cursed by her father, King Vaux, while in the Queen’s womb, Nameless was born a plague to the world. Anyone she comes close to either dies from a mysterious sickness or goes utterly mad. Those foolish enough to touch her die within hours. After Nameless’s mother died while giving birth, the kingdom’s four royal Blood Mages cared for her from afar. Knowing her curse, they provided her with undead servants through necromancy since only the undead were immune from her disturbing influence. Nameless was kept deep within the castle and raised by her skeletal ancestors while the royal Blood Mages saw to her kingdom. When she was old enough to understand her position, she demanded Queenhood but was denied, for the blood mages wanted control. Her undead ancestors warned Nameless that the four had plans to exhume and reanimate the bones of the dead King Vaux , to use him as a puppet for ruling the land. Nameless was to be killed but escaped through the use of dark shadow magic. She secretly lingered in the royal graveyard for some time after her escape, staying in the shadows and raising the dead for protection, knowledge, and company. Nameless eventually met the Blood Mage Paethus and conversed with him from a distance. Without knowing Nameless was the dead king’s daughter, Paethus revealed that he was a powerful Blood Mage allied with the royal mages, there to resurrect King Vaux. Her risen family and protectors were provoked to violence by this revelation and attacked Paethus, resulting in their total obliteration. Infuriated and fearful, Nameless fled. 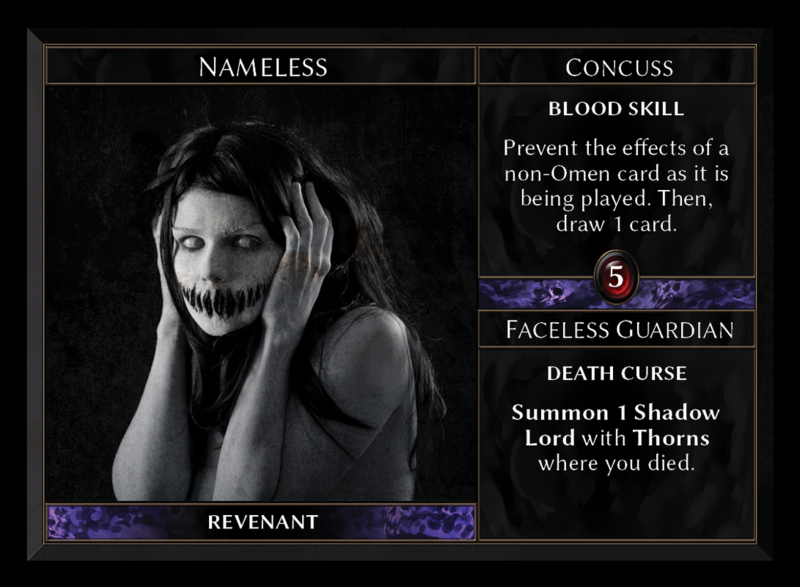 Nameless has been sighted several times over the last 50 years, appearing only in shadows and possessing a frightening amount of power over shadowy demons and the undead. Having become a Revenant bent on the destruction of the living and those in her way, Nameless seeks to become ruler of The Land and take her place as Dark Lord on the dark throne.